DMX 600 MHz NMR spectrometer. It has four channels and XYZ gradients. range of 0-60 degrees Celsius. the spectrometer room for sample preparation. 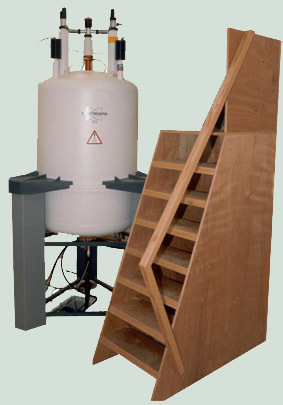 We are happy to provide NMR services for academic institutions and for industry. Please see sample requirements below. For information regarding prices and scheduling, please contact Debbie Shalev. It is strongly recommended to consult Debbie before preparing the sample. A minimum of 1-3 mM of compound in 400-500 mL is required forpreliminary assessment of NMR spectra for structural work. This corresponds to 0.4-1.6 mmole of compound. (Multiply by molecular weight for necessary sample weight in grams. )A minimum of 1-3 mM of compound in 400-500 mL is required forpreliminary assessment of NMR spectra for structural work. requires a minimum of approximately 0.6 mM in 400 mL (0.25 mmole). The sample must be >95% pure by HPLC for structural work. The sample will need to be dissolved in deuterated solvent or deuteratedsolvent will need to be added to the sample. It is recommended to bring well lyophilized compound and prepare the sample in the NMR preparatory laboratory. no hydrogens). Usually this means using phosphate buffer and inorganic salts. The sample must be stable under the acquisition conditions for a timescale of weeks. NMR does not harm samples in any way and samples should be completely recoverable unless they undergo degradation of any form or mechanical loss of compound occurs. The compound must be completely soluble or miscible with the chosen solvent. It must be monomeric in solution. parameters you want to use and the desired pH (acidic is better for NMR).